The intervertebral discs (IVDs) segmentation and localization on medical images are important for the clinical diagnosis and research of spine diseases. In this work, we proposed a robust automatic method based on 2.5D multi-scale fully convolutional network (FCN) and geometric constraint post-processing for IVD segmentation and localization on 3D multi-modality Magnetic Resonance (MR) scans. Firstly, we designed a 2.5D multi-scale FCN. And the ensemble outputs of such three networks are used as the IVD prediction maps. The final segmentation and localization of IVDs are generated from these prediction maps with a geometric constraint post-processing method. 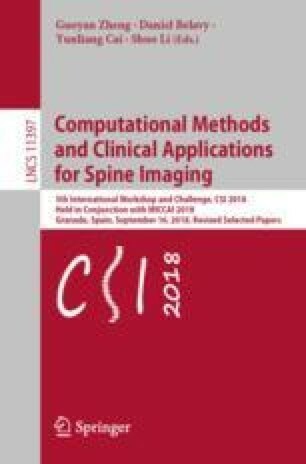 This work ranked the first in the on-site test of MICCAI 2018 Challenge on Automatic Intervertebral Disc Localization and Segmentation from 3D Multi-modality MR Images (IVDM3Seg).